Claire Murray Rugs warm your floors and your home with a collection of hand hooked area rugs designed by celebrated artist, Claire Murray. 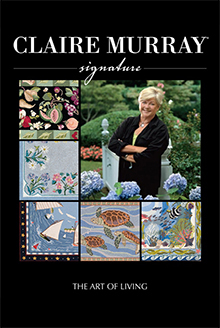 Claire Murray Coastal Rugs - Nantucket is where it all began for Claire Murray, and now she shares her creations with you. Discover Claire Murray area rugs for your indoor spaces that are inspired by seaside living, featuring a variety of captivating coastal themes from whimsical whales to mermaids and myths, seashells, sailboats and more original artwork inspired by the magical essence of Nantucket. Themed hand hooked area rugs - Treat your bare floors to hand hooked rugs featuring Claire Murray's delightful and heartwarming designs. From soothing Coastal designs to quaint French Country themed rugs, you'll find dozens of styles and sizes to choose from including American heritage rugs, old fashioned Holiday themes, Floral hand hooked area rugs, Sisal and Natural Fiber coordinates, Wine Country, Kindred Spirit styles and the Lodge Collection featuring Claire Murray rugs that capture the essence of the mountains, forests and lakesides. Home decor accessories - Claire Murray Rugs add a touch of character and personality to your home with themed rugs designed to work side-by-side throughout your home, as well as charming decor accents that were created to coordinate with all of the lovely hand hooked area rugs in her collection. Choose from bedding and cashmere throws, stoneware and tabletop accessories, chair pads, stationery and more home decor accessories that will help you fully realize and live the Claire Murray lifestyle. Clair Murray kits & crafts - Claire Murray brings you everything you need to master the art of rug hooking, needlepoint and cross stitching with a complete selection of leisure craft kits that include Claire's original design, crafting tools, materials and easy how-to instructions. Choose from needlepoint and counted cross stitch kits, hand hooked area rug kits, needlepoint pillow kits, hand hooked chair pad kits and valuable rug hooking accessories and instructions that will have you crafting your very own Claire Murray rugs and cozy costal creations in no time. Claire Murray Rugs brings the beauty of the sea into your home, featuring hand hooked rugs, bedding, tabletop accessories and more delightful home accents. From coastal and floral themed Claire Murray area rugs to bedding, stoneware and easy DIY craft kits, ClaireMurray.com brings you original home decor creations that will help you embrace everything there is to love about the enchanting town of Nantucket.